Computational modeling that examines evidence of how hominin groups evolved culturally and biologically in response to climate change during the last Ice Age also bears new insights into the extinction of Neanderthals. Details of the complex modeling experiments conducted at Arizona State University and the University of Colorado Denver will be published in the December issue of the journal Human Ecology, available online Nov. 17. "To better understand human ecology, and especially how human culture and biology co-evolved among hunter-gatherers in the Late Pleistocene of Western Eurasia (ca. 128,000-11,500 years ago) we designed theoretical and methodological frameworks that incorporated feedback across three evolutionary systems: biological, cultural and environmental," said Michael Barton, a pioneer in the area of archaeological applications of computational modeling at Arizona State University. "One scientifically interesting result of this research, which studied culturally and environmentally driven changes in land-use behaviors, is that it shows how Neanderthals could have disappeared not because they were somehow less fit than all other hominins who existed during the last glaciation, but because they were as behaviorally sophisticated as modern humans," said Barton, who is lead author of the published findings. The paper "Modeling Human Ecodynamics and Biocultural Interactions in the Late Pleistocene of Western Eurasia" is co-authored by Julien Riel-Salvatore, an assistant professor of anthropology at the University of Colorado Denver; John Martin "Marty" Anderies, an associate professor of computational social science at ASU in the School of Human Evolution and Social Change and the School of Sustainability; and Gabriel Popescu, an anthropology doctoral student in the School of Human Evolution and Social Change at ASU. "It's been long believed that Neanderthals were outcompeted by fitter modern humans and they could not adapt," said Riel-Salvatore. "We are changing the main narrative. Neanderthals were just as adaptable and in many ways, simply victims of their own success." The interdisciplinary team of researchers used archeological data to track behavioral changes in Western Eurasia over a period of 100,000 years and showed that human mobility increased over time, probably in response to environmental change. 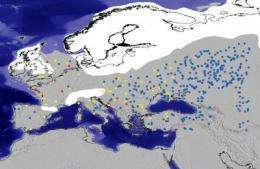 According to Barton, the last Ice Age saw hunter-gathers, including both Neanderthals and the ancestors of modern humans, range more widely across Eurasia searching for food during a major shift in the Earth's climate. The scientists utilized computer modeling to explore the evolutionary consequences of those changes, including how changes in the movements of Neanderthals and modern humans caused them to interact  and interbreed  more often. According to Riel-Salvatore, the study offered further evidence that Neanderthals were more flexible and resourceful than previously assumed. "Neanderthals had proven that they could roll with the punches and when they met the more numerous modern humans, they adapted again," Riel-Salvatore said. "But modern humans probably saw the Neanderthals as possible mates. As a result, over time, the Neanderthals died out as a physically recognizable population." To reach their conclusion, the researchers ran a computer program for the equivalent of 1,500 generations showing that as Neanderthals and modern humans expanded their yearly ranges, the Neanderthals were slowly absorbed by more numerous modern humans until they had disappeared as a recognizable population. "We tested the modeling results against the empirical archaeological record and found that there is evidence that Neanderthals, and moderns, did adapt their behaviors in the way in which we modeled," explained Barton. "Moreover, the modeling predicts the kind of low-level genetic admixture of Neanderthal genes that are being found in the newest genetic studies just now being published. "In other words, successful behavioral adaptations to severe environmental conditions made Neanderthals, and other non-moderns about whom we know little, vulnerable to biological extinction, but at the same time, ensured they made a genetic contribution to modern populations," Barton said. The authors noted that "the methods we illustrate here offer a robust, new framework in which researchers can begin to examine the effects that such invisible characteristics could have on the observable record." "The kind of modeling we did in this research is very new in paleoanthropology, as is the continental scope of the archaeological analysis we used to test the model results," noted Barton. "However, such computational modeling can refine our understanding of long-term human impact on the environment that can help inform land-use decisions for our future," said Barton, who also is co-director of ASU's Center for Social Dynamics and Complexity, which leverages the emerging field of complex systems to foster interdisciplinary research on fundamental questions of social life.